Is there any information on the actual chemical composition of HSV1 and varieties? The Herpes viruses have a unique four-layered structure: a core containing the large, double-stranded DNA genome is enclosed by an icosapentahedral capsid which is composed of capsomers. The capsid is surrounded by an amorphous protein coat called the tegument. It is encased in a glycoprotein-bearing lipid bilayer envelope 1. 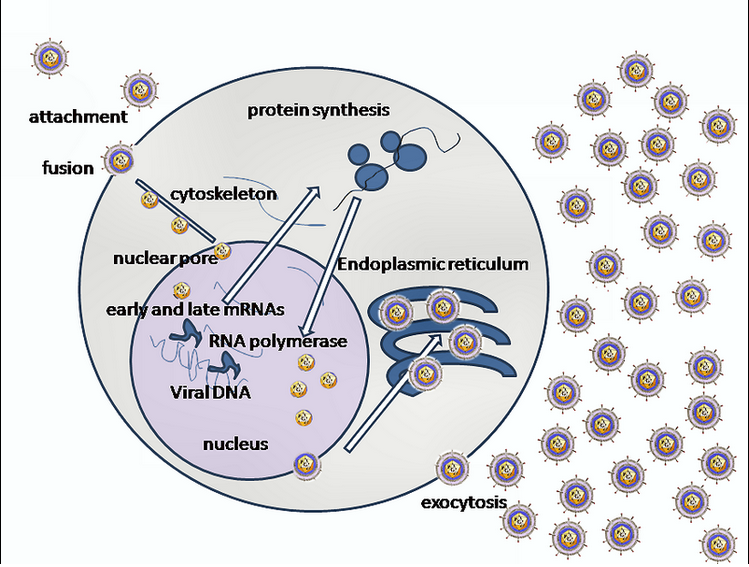 HSV is a nuclear replicating, icosahedral, enveloped DNA virus. The HSV envelope contains at least 8 glycoproteins. The matrix or tegument which contacts both the envelope and the capsid contains at least 15-20 proteins. What virus transforms full grown plants? What is the evolutionary purpose of shingles afflicting only one side of the body?